We study the partition of energy between waves and vortices in stratified turbulence, with or without rotation, for a variety of parameters, focusing on the behaviour of the waves and vortices in the inverse cascade of energy towards the large scales. To this end, we use direct numerical simulations in a cubic box at a Reynolds number $Re\approx1000$, with the ratio between the Brunt–Väisälä frequency $N$ and the inertial frequency $f$ varying from $1/4$ to $20$, together with a purely stratified run. 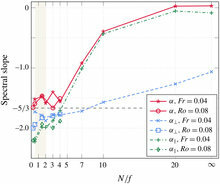 The Froude number, measuring the strength of the stratification, varies within the range $0.02\le Fr\le0.32$. We find that the inverse cascade is dominated by the slow quasi-geostrophic modes. Their energy spectra and fluxes exhibit characteristics of an inverse cascade, even though their energy is not conserved. Surprisingly, the slow vortices still dominate when the ratio $N/f$ increases, also in the stratified case, although less and less so. However, when $N/f$ increases, the inverse cascade of the slow modes becomes weaker and weaker, and it vanishes in the purely stratified case. We discuss how the disappearance of the inverse cascade of energy with increasing $N/f$ can be interpreted in terms of the waves and vortices, and identify the main effects that can explain this transition based on both inviscid invariants arguments and viscous effects due to vertical shear.